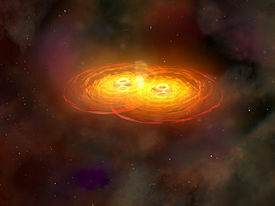 An artist depiction of two black holes merging, a process in which the laws of thermodynamics are upheld. It is not possible to form a black hole with vanishing surface gravity. κ = 0 is not possible to achieve. The zeroth law is analogous to the zeroth law of thermodynamics which states that the temperature is constant throughout a body in thermal equilibrium. It suggests that the surface gravity is analogous to temperature. T constant for thermal equilibrium for a normal system is analogous to κ constant over the horizon of a stationary black hole. Extremal black holes have vanishing surface gravity. Stating that κ cannot go to zero is analogous to the third law of thermodynamics which, in its weak formulation, states that it is impossible to reach absolute zero temperature in a physical process. The strong version of the third law of thermodynamics, which states that as the temperature approaches zero, the entropy also approaches zero, does not have an analogue for black holes. However, the strong version is violated by many known systems in condensed matter physics, and has therefore been rejected as a law. More fundamentally, 't Hooft and Susskind used the laws of black hole thermodynamics to argue for a general Holographic Principle of nature, which asserts that consistent theories of gravity and quantum mechanics must be lower dimensional. Though not yet fully understood in general, the holographic principle is central to theories like the AdS/CFT correspondence. Bardeen, J. M.; Carter, B.; Hawking, S. W. (1973). "The four laws of black hole mechanics". Communications in Mathematical Physics 31 (2): 161–170. doi:10.1007/BF01645742. Bekenstein, Jacob D. (April 1973). "Black holes and entropy". Physical Review D 7 (8): 2333–2346. doi:10.1103/PhysRevD.7.2333. Hawking, Stephen W. (1974). "Black hole explosions?". Nature 248 (5443): 30–31. doi:10.1038/248030a0. Hawking, Stephen W. (1975). "Particle creation by black holes". Communications in Mathematical Physics 43 (3): 199–220. doi:10.1007/BF02345020. Hawking, S. W.; Ellis, G. F. R. (1973). The Large Scale Structure of Space-time. New York: Cambridge University Press. ISBN 0521099064. Hawking, Stephen W. (1994). "The Nature of Space and Time". ArΧiv e-print. arΧiv:hep-th/9409195v1. 't Hooft, Gerardus (1985). "On the quantum structure of a black hole". Nuclear Phys. B 256: 727–745. doi:10.1016/0550-3213(85)90418-3. http://igitur-archive.library.uu.nl/phys/2005-0622-153848/14549.pdf.